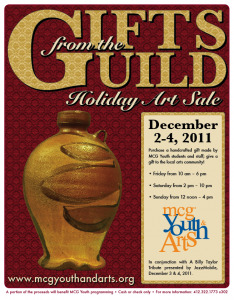 Once again, Manchester Craftsmen's Guild is hosting its annual art sale, Gifts from the Guild. On December 2-4 you can visit the MCG ceramics studio and purchase a handcrafted gift made by students and staff (including Amanda Wolf, Keith Hershberger and myself). 40% of all sales go directly towards youth and arts programming. In conjunction with A Billy Taylor Tribute presented by JazzMobile, December 3 & 4, 2011.